An-Nasiriyah, 23 March 2003. For no less than four hours, Charlie Company, 1st. Battalion, 2nd. Marines becomes the main effort of the entire Task Force Tarawa. The story is still fresh in the collective memory of the US Marine Corps. Maybe too fresh to war game it without pausing and reflecting on the sacrifices made by these Marines. They will not be forgotten. The game is John Tiller's Squad Battles Modern War. This is a turns and hexes war games with scenarios from the wars in Iraq and Afghanistan. The particular scenario I will be playing is named "Nasiriyah". 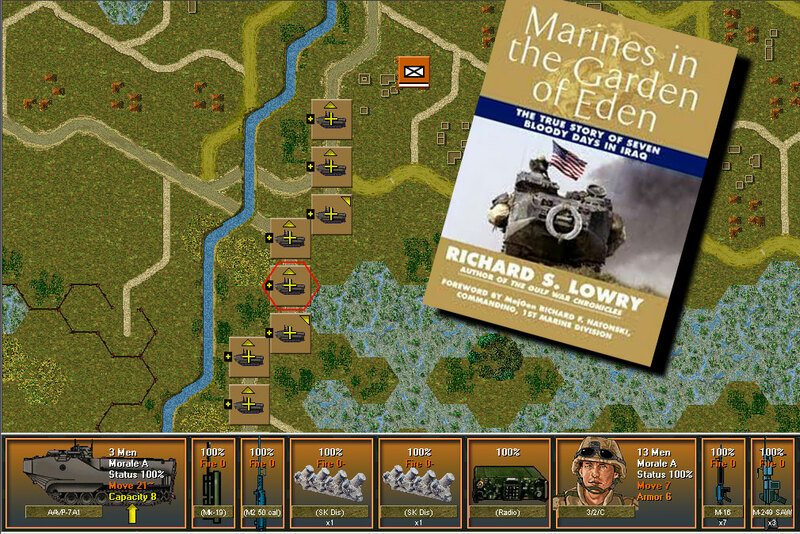 The book is Marines in the Garden of Eden, by Richard Lowry. This book is one of the finest in the ever growing literature about the US Marine Corps. There is another great book about this fight we are about to re-live: Ambush Alley by Tim Pritchard. I'm saving Pritchard's book for another blog entry in which I will play some aspect of the battle with ArmA 2 or Combat Mission Shock Force (if I am ever able to recover my license, which was lost during a computer crash a couple of years ago). The story of how Charlie Company got into this fight is a great example of the effects of the fog of war and the initiative of a company commander. In the original plans for the seizing of the two bridges at An Nasiriyah, Bravo Company would cross the southern bridge over the Euphrates and then skirt the populated area by moving north along the eastern edge of the city. Alpha Company was to follow Bravo Company and secure the bridge over the Euphrates. In turn, Charlie Company was to follow Bravo, being their objective to reach the northern bridge over the Saddam Canal. After successfully crossing the Euphrates river bridge, Bravo Company moved east and got immediately bogged down in open sewers. The few Abrams tanks in support of Bravo Company were also trapped in the quagmire. Alpha Company moved according to plan and became heavily engaged with Iraqi irregulars who in a frenzy of gunfire (apparently emboldened after their success ambushing the US Army 507th Maintenance Company convoy) were a far cry from what intelligence sources had previously predicted as a warm welcome to the US forces. Charlie Company arrived to the Euphrates bridge out of communications with the battalion commander and couldn't make out where Bravo was. In a fateful command decision, the company commander decided to go straight into An Nasiriyah, aiming for the second objective: the northern bridge over the Saddam Canal. The game scenario starts with Charlie Company some 2.5 kilometers south from the bridge over the Saddam Canal. Unsupported by the rest of the battalion, the objectives (circles in the map shown at the left) for Charlie are the northern bridge (100 points each) and two intermediate objectives (50 points each) which I am not to fond on keeping (do we really want to leave Marines in the middle of this town?). The company is moving in 13 AAVP-7A1s and a single HMMWV (company commander). Regarding your CMSF license, did you save it in your email folder? I just reinstalled CMA and had to go trough the license thing myself. Yes I have a hard copy of the game and the license number. It looks like my de-activation of the license for the old installation doesn't go through and I can't reinstall it without that deactivation. SB is a great engine. It plays like the Advanced Squad Leader without all the fuss. The AI is nothing to write home about, but for scenarios like this (AI defending) it kicks my rear end consitently. Hi, JC. An unrelated question: can you recommend something from recent military theory literature? Were there any breakthroughs lately? Can't honestly recommend anything. Read quite a bit about network and entropy based warfare. Sounded like a lot of recycled gibberish techno hype with no value for when bullets are flying. I guess it's back to maneuver warfare for a while. I got a new book about agent-based simulations that impressed me quite a bit. I'm going to post about it really soon. Didn't work. What happened to me is that the computer where I had the games crashed and I can't deactivate my license. Thus I can re-install on my current computer (license is already in use).